So technically, it’s not yet summer or not anymore (considering its raining again like hell after a few beautiful and warm early summer days..). Anyways, it’s never too soon to get back into shape and stock on your favourite summer beauty products! Bumble & Bumble Surf Spray: THE one and only style product, I use it all year long! But especially during summer you won’t want to miss out on the most amazingly beachy, wavy hair. Johnson’s Baby Shampoo with natural lanvendar: Forget all the super fancy shampoos…this one will make your hair the most soft and shiney!! It comes with the NO MORE TEARS formula, as well as good, old childhood memories! Nuxe Huile Prodigieuse Or: This oil from favourite french brand guarantees the perfect summer legs. Nothing more to add…except I wish the products were less expensive outside France. Rodin Lip Balm: After the best-seller olio lusso, stylist Linda Rodin created a new, highly coveted beauty product: an ultra smoothening lip balm based on natural ingredients only. Soleil Tan de Chanel: This light bronzing make-up base is one of the best products ever! It creates a perfect sun-kissed look and is worth every cent! Supergoop Sunscreen whipes SPF 30+: Sun protection was never that easy. Those face and body whipes fit perfectly into your purse and are super practical on the way..get them via Colette. Kusmi Algotea: Green tea with mint and seaweeds. It’s rich in vitamins and anti-oxidants..in short the perfect wellness drink. However, it has a very particular taste…I say you either love it or hate it ;) So, if you wanna go safe there is always the classical Kusmi detox tea, which is also perfect to make your own, healthy ice tea. 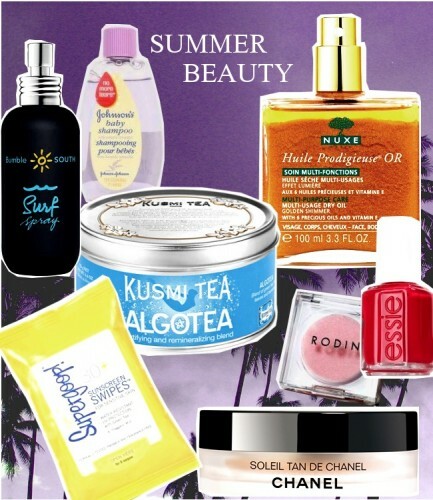 So what are your favourite beauty products for the summer? ?